A broken arm is a common injury; about one in 20 broken bones involves the upper arm bone, according to the American Academy of Orthopaedic Surgeons. 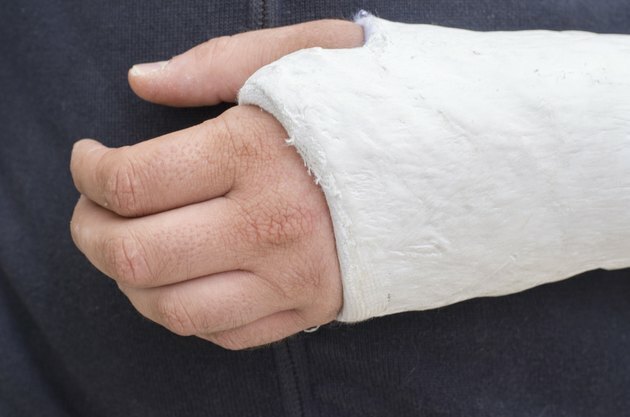 Broken arms are usually caused by falling on an outstretched hand or being involved in a car crash or some other type of accident, and they typically cause extreme pain at the injury site. Fortunately, there are some things you can do to relieve the pain. Elevate the injured arm above your heart and apply ice to the injury as soon as possible. According to MayoClinic.com, ice can help limit swelling and relieve pain immediately after an injury. Elevating the injured arm will also help reduce swelling and therefore reduce pain. Talk to your doctor about pain management options during treatment. Some broken arms require surgery while others do not require anything but a cast. Certain displaced fractures might have to be moved back into place via reduction; during this process, you may need a muscle relaxant, sedative or anesthetic for pain. Follow your doctor's recommendation on pain management after you leave the office or hospital. Doctors may recommend over-the-counter pain relievers or write a prescription for a narcotic medication for a few days. Begin rehabilitation as soon as possible. In most cases, it is important to have as much motion with the injured arm as possible to minimize stiffness in the hand, arm and shoulder. Rehab can help alleviate pain and stiffness in the joints and muscles. Additional rehab may be required after the sling or cast is removed to restore strength, range of motion and flexibility in the repaired arm.